The last few years of my career have been within the medical spa industry using a number of different lasers and medical grade products to correct a variety of skin conditions. While I still believe there is a time and place for these treatments, a recent stint with ill-health managed to reignite my passion with all things holistic and organic, particularly within the beauty industry. 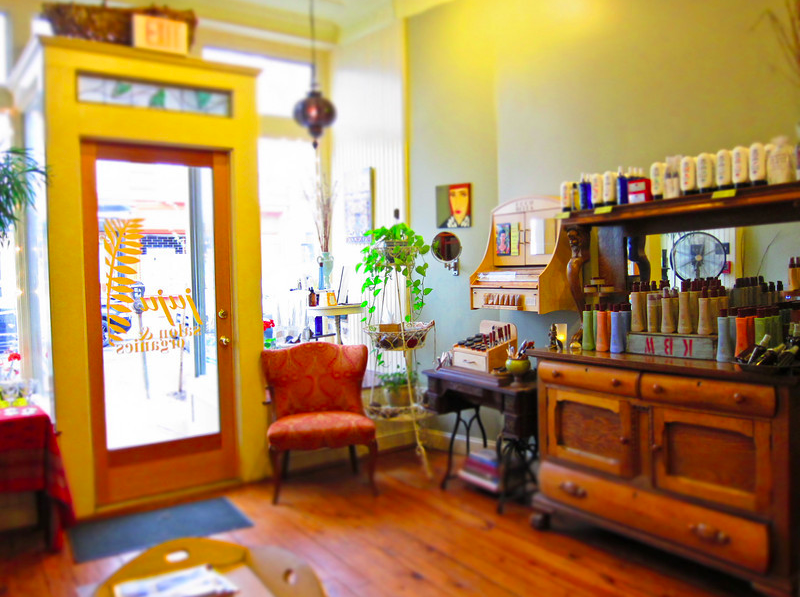 At the forefront of all things organic, Eco-driven and sustainable in the beauty industry is Julie Ebner, founding owner of juju organics, Philadelphia’s first wholly organic and non-toxic hair salon and day spa. Initially I contacted Julie in an effort to learn more about their range of treatments and products. However, along the way I ended up learning a great deal more from an inspiring woman with the vision to minimise environmental hazards, sustain an Eco-driven business, offer safe yet effective alternatives to employees and clients in a toxin-laden industry … I have learnt a lot more than expected and found out there is definitely more to organic and holistic driven beauty than meets the eye. In 2005 Julie decided to open her own organic, sustainable and environmentally aware salon after working as a hair stylist and esthetician in conventional salons for 7 years. Realising the traditional salon environment lacked natural, non-toxic, organic and cruelty-free products and services juju organics was born. In 2007, a spa to complement the hair salon was opened, again focusing on organic products and practices. juju organics encapsulates the green business concept completely: Unlike other salons and spas, juju’s products and services do not contribute toxic chemicals to waste water. It is a known fact that cosmetic companies, makers of skin and body products, can put almost any ingredient into its products without government review or approval. The Food and Drug Administration (FDA) has no authority to require companies to test products for safety. FDA does not review or approve the vast majority of products or ingredients before they go on the market. This includes: fragrance, PEGs, ceteareths and polyethylene. Parabens: propyl, isopropyl, butyl, isobutyl, DMDM hydantoinphthalate plasticizers, paraben preservatives, the pesticide triclosan, synthetic musk’s, and sunscreens. None of juju’s products contain any of these ingredients. I don’t think I have met a hairdresser or esthetician that hasn’t at some point had to wear protective gloves or taken time off work due to weeping inflamed skin caused by working with the number of toxic chemicals so prevalent in hair colours, bleach and other hair care products. Chronic contact dermatitis and other skin conditions are a common work hazard in the beauty industry and one that is readily accepted and rarely questioned. Conventional salon products contain synthetic chemicals that are irritating and harmful to the body. Examples include: inhalation of toxic ammonia fumes generated by most professional hair dyes; hazardous levels of exposure to Formaldehyde from hair straightening (Brazilian keratin treatment) and nail lacquers. Skin irritation from toxic chemicals and known irritants found in hair dyes, hair straightening and curling services, shampoos, lotions, styling products. It’s simply refreshing to hear that juju provides continuing education to its employees regarding the risks of using chemical laden and potentially toxic personal care products and natural, non-toxic professional products. Integrity and education in business starts at the top, amongst the owners and managers. We need more conscious employers educating their staff, who in turn educate the clients and hence the community. Oh how I wish more companies would stand up and follow suit. Much like Big Tobacco, beauty companies historically have sought to mislead and keep consumers in the dark as to the negative and toxic results caused by many conventional beauty products. This puts into context the scope of Julie’s vision and reasons for creating juju organics. In all honesty I couldn’t fathom trying to put together a sustainably viable and green business, information and resources have increased immensely over the last 8 years but passion and conviction still need to be the driving force in following through in such and I think this is what seperates juju from many companies jumping on the ‘organic’ and ‘green’ bandwagon. ‘Wholly organic’ and ‘non-toxic’ aren’t just marketing terms thrown about to gain a quick buck at out expense but a personal conviction that has grown and proven to be a very successful and lucrative business model. ◾Strict recycling of trash is adhered to. ◾Fume Free Salon and Spa: no ammonia, no PPDs (Phenylenediamine, a contact allergen) and no Resorcinol (a toxic hair and skin irritant known to be damaging to the immune system) in hair colour. ◾Low or no VOC (volatile organic compound) nail polishes used by Nail Technician. ◾No synthetic fragrances or perfumes in any of juju’s sourced product range. ◾juju uses only 100% biodegradable bags, recycled paper bags and fair-traded, reusable jute bags for retail sales. ◾All spa sheets, blankets and robes are made from 100% organic cotton and/or bamboo. ◾The majority of juju’s furniture, display items and furnishings were bought second hand, trash picked and/or are re-purposed goods. ◾Filtered water, not bottled water is offered to guests. ◾Facilities are PECO Wind Powered. ◾All green cleaning products used are natural, non-toxic and biodegradable. ◾Office supplies are purchased from Greenline Office Supply, a Certified Green Company. ◾All Salon and Spa products used on clients and sold as retail have 100% product ingredient disclosure. All such products are manufactured by green, sustainable companies who follow strict environment-friendly manufacturing procedures including: using recycled packaging, soy inks, organic plant based ingredients, non-use of synthetic, toxic or non-renewable ingredients. 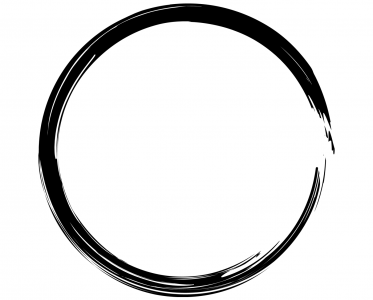 ◾Regularly holds free workshops for its clients and the community: meditation classes; holistic health counselling and feng shui. AWESOME! ◾Organizes and promotes “food drives” for Philabundance and Project Home on a regular basis. MORE AWESOME! ◾Why aren’t more salons and spas going green? ◾A treatment offered at juju spa is offering weight loss through acupuncture … I need to know more! The way that I approach weight loss with my patients (or any other health concern for that matter) is by firstly addressing underlying patterns of disharmony, bringing the body back into balance in general, and then working with the patient to identify triggers that result in weight gain. Acupuncture can help with endocrine imbalances, and with impulses or cravings. I work with patients from a nutrition and lifestyle standpoint, and help them structure an optimal environment for themselves in which to lose weight. That being said, acupuncture can’t “make” someone not eat, or mysteriously drop weight overnight. The patient has to be committed to the task. There’s a theme with acupuncture, whether for smoking cessation, or weight loss or even pain management: acupuncture works with your body to bring it back into balance, but does ask for patient participation- learning to understand how you feel in your body and what makes you feel better or worse – Gabrielle Applebaum. ◾Obsessed with my hair, since it started to fall out, the gradual climb back to full and luscious hair, is ever at the forefront of my mind ( all about me and my needs) … How do organic results compare in comparison to bleaching and dyeing, can I expect my blow out to be just as big and full of volume a la Kate Middleton? Last words from me … Thanks Julie, I’m truly inspired, feel invigorated and excited to be working in an industry that looks to create and promote beauty while educating the masses. 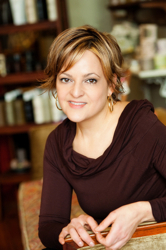 Julie Ebner ~ Founding Owner of Juju Organic Salon and Spa in Philadelphia is a nationally recognized “green” beauty expert and contributes regularly to publications such as Allure, Natural Living, Marie Claire, American Salon, Philadelphia Magazine, Philadelphia Style, and Martha Stewart’s Whole Living. 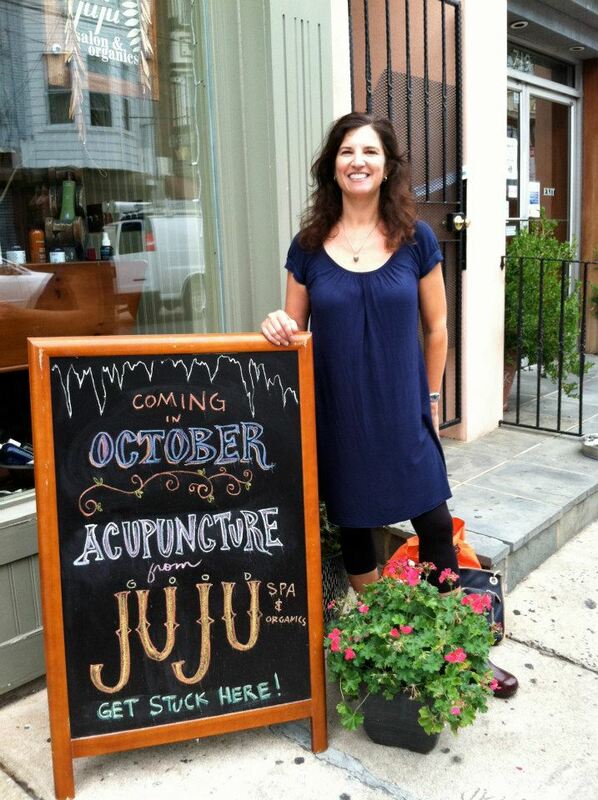 juju is a member of the National Association of Eco-Friendly Spas & Salons, the Sustainable Business Network of Philadelphia and is Green Office Certified. Gabrielle Applebaum ~ trained in Chinese Medicine at the Won Institute of Graduate Studies in Glenside, Pennsylania (M.Ac., L.Ac., Dipl.Ac.). She is also a graduate of the University of Chicago (BA) and Harvard Divinity School (MTS). Acupuncture uses the natural, vital, inherent energy in all living things in helping the body to heal itself. Another total mind, body and spirit therapy available at juju organic spa!